Chromebooks are on the up and up. 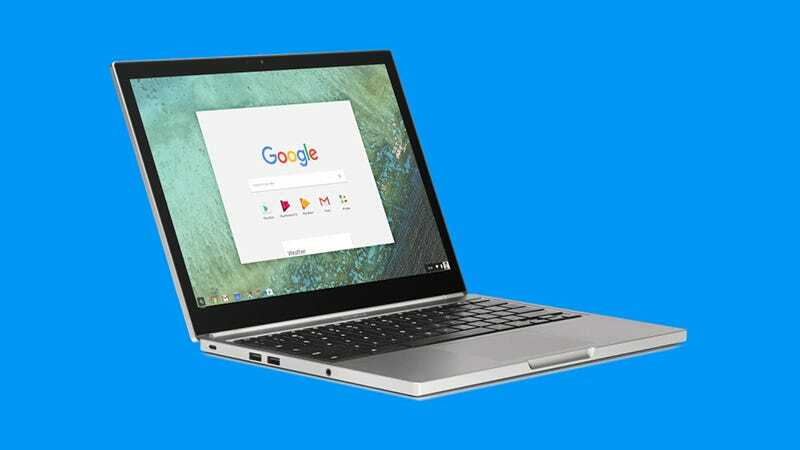 If you’re using a laptop running Google’s lightweight, web-based Chrome OS software, there are a bunch of hidden tricks you might not be aware of, from safely giving others access to your Chromebook to getting the newest features for the OS before anyone else. Here are 10 tips for becoming an expert Chromebook user. Chromebooks have limited local storage, but you’re encouraged not to use it, and Google Drive appears as an option whenever you download something from the web. To have Chrome OS save files straight to Google Drive with no prompt, open up the Settings dialog then click Show advanced settings. Under Downloads, click Change, then specify your Google Drive (or any folder inside it), and click on Open. Back on the Settings screen, untick the box marked Ask where to save each file before downloading. The change is saved automatically and new downloads will go straight to your cloud storage. Chromebooks have slowly been getting better at working without an internet connection, and Google’s office suite has been leading the way. You can create, edit, and view documents, spreadsheets, and presentations without any internet connectivity, but there’s a setting you need to enable first. From the front My Drive view in Google Drive, click on the gear icon and choose Settings, then tick the box next to Offline labelled Sync Google Docs, Sheets, Slides & Drawings files to this computer so that you can edit offline. Any changes are automatically synced back when an internet connection is detected. A Chromecast gives you an easy way of getting your laptop’s display up on your television screen. Click the status bar in the lower right-hand corner, then pick the Chromecast option and select your HDMI dongle from the list. Confirm the action on the next dialog box. The casting feature lets you send audio as well as visuals over to the Chromecast dongle, so it’s one way of getting video from Chrome OS to a TV or monitor. It also works well for photo slideshows. To stop casting, click on the status bar again, then select Stop next to the Chromecast option on the pop-up menu. Most Chromebooks don’t come with the best-looking displays, but you can adjust this (and fit more on the screen) by clicking on Display settings in the Settings menu and changing the resolution manually. You can usually increase the resolution without causing any glitches. Of course, there are also the standard zoom tools available in the Chrome browser as well if you’re having trouble fitting everything on one screen. Use the zoom tools in the main Chrome OS menu or Ctrl+plus or Ctrl+minus to change the zoom level. Ctrl+0 resets the zoom level back to 100 percent. Having to type out your Google password every time you start up your Chromebook isn’t ideal, as secure as it might be. Instead, you can tell Chrome OS to sign you in automatically if it detects a trusted smartphone is nearby. Open up the Settings page then click Show advanced settings to get started. Smart Lock is the option you need. Click Set up and you’ll be guided through the process of connecting Chromebook to phone (Bluetooth needs to be switched on on both devices). When your phone is in range in the future, you’ll just need to click on your user account avatar to get into your Chromebook. As with the Chrome browser, there are different versions of Chrome OS to choose between, and if you find the stable version too staid and boring, you can live life on the edge by switching to the beta or development channels. You get the newest features first in return for a few extra bugs. From the Settings screen click About Chrome OS, then More info..., and the Change channel button appears. Make your choice (Google explains the different options) and click Change channel... to confirm. If you’re switching to a more stable channel, then your Chromebook will be wiped in the process. As straightforward and lightweight as Chrome OS is compared with other operating systems like Windows and macOS, there might still be occasions when you run into problems. If that happens, the task manager can help. Launch it with Shift+Esc from the desktop and it appears in a separate window. It will be familiar to anyone who’s ever seen a task manager before. You can see each open tab and every running extension, together with how much CPU time, memory space and network bandwidth they’re all using up. Select any entry and click End process to stop any troublesome apps or add-ons. There might be times when other people are using your Chromebook, but how do you oblige without giving them access to your Google search history and Facebook account and everything else that opens automatically with your web browser? The answer is the Guest Mode built into Chrome OS. From Settings, click Manage other users and then tick Enable Guest browsing. On the login screen you’ll notice a Browse as Guest option. Click on this and you get a blank, anonymous browser window that anyone can use to surf the web, check social media, and so on without affecting your account. Everyone’s talking to their computers these days, and you can set up the same “OK Google” voice trigger available on Android on Chrome OS as well. All you need to do is open up the Settings dialog and tick the box marked Enable “OK Google” to start a voice search (under the Search heading). With that done, you can say “OK Google” on the Google website, with a new tab open, or with the Chrome OS app launcher. You’ll need to grant permission to use the microphone the first time, and you can then run any search query using your voice, with the results shown on screen and read back to you. The Chromebook keyboard has some unusual tweaks—a search key instead of a Caps Lock button for example—and there are also plenty of keyboard shortcuts built into the OS. To see them all, press Ctrl+Alt+?. Hold down Alt, Ctrl, Shift or Search to see the shortcuts associated with each one. There are plenty of shortcuts to play around with but some of the ones we found ourselves using most often include Ctrl+W to close a tab and Ctrl+Shift+T to bring back the most recently closed tab. Alt+[ or Alt+] are also useful shortcuts for docking Chrome OS windows to the left or right of the display.